Alistair Royse, Zulfayandi Pawanis, David Canty, Jared Ou-Young, David Eccleston, Andrew Ajani, Christopher Reid, Rinaldo Bellomo, Colin Royse. The University of Melbourne researchers have presented a very new concept in Vienna in October through 51,113 patients. Most coronary bypass operations worldwide use vein taken from the leg; but use of any vein graft (even 1 graft) has an adverse effect on late survival. Does any saphenous vein graft lead to worse late survival after coronary bypass surgery: A cohort study of 51,113 patients? The use of saphenous vein grafts (SVG) remains the mainstay of coronary surgery (CABG) despite numerous reports indicating better long-term patency and improved survival with the use of more arterial conduits. However, a recent study raised doubt as to whether a second internal mammary artery improves survival . Yet we know that the long-term durability of SVG is relatively poor; and predictably so. One logical argument approach would be not to use any SVG, favouring exclusive use of arterial conduits, total arterial revascularisation (TAR). In the USA it is estimated that only 5% and in the UK only 10% of CABG patients receive TAR. Since most patients require ≥3 grafts, the crucial hurdle seems to be the need to rely on alternative arterial conduits like the radial artery (RA) to achieve sufficient replacement of SVG. And a common view is that RA is perhaps no better than – or even worse than – SVG. This study analyses all arterial conduits as being equal, including a lack of differentiation as to the target vessel grafted or the reconstruction method used. The two groups were: TAR or Any use of SVG (even a single graft), irrespective of the number of arterial grafts. The logic is, that if SVG is the predominant conduit that fails over time, then this is the most important factor in determining survival. Further, greater use of SVG should lead to incrementally reduced survival. In an Australian registry, 51,113 primary CABG were identified and survival determined by linkage to the Australian Institute of Health and Welfare, national death registry. The first half of the data was dominated by contributing hospitals in Melbourne, which are known to have high rates of arterial conduit use relative to world rates. The second half of the study period saw additional centres contribute from centres elsewhere in Australia where there was less use of arterial conduits. Overall, about half of the grafts in the TAR group were performed with RA; whereas a quarter of the arterial grafts and one tenth of all grafts in the Any SVG group were constructed using RA. Survival was worse if any SVG was used, P < 0.001 and mortality hazard ratio (HR) = 1.24, Figure 1. A propensity score matched cohort using 24 variables and calliper of 0.05 (n = 28,710) found a higher hazard for mortality with any SVG use of 1.22 (95% CI 1.15 – 1.30), P < 0.001. 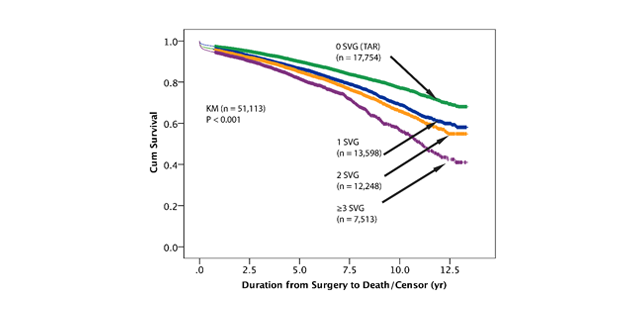 When patients with SVG were divided into 1, 2 or ≥ 3 SVG, there was a significant and incrementally worse survival compared to TAR, P < 0.001, Figure 2. Any use of saphenous vein graft was associated with worse survival. Coronary artery bypass grafting: Factors effecting outcomes. Figure 1. 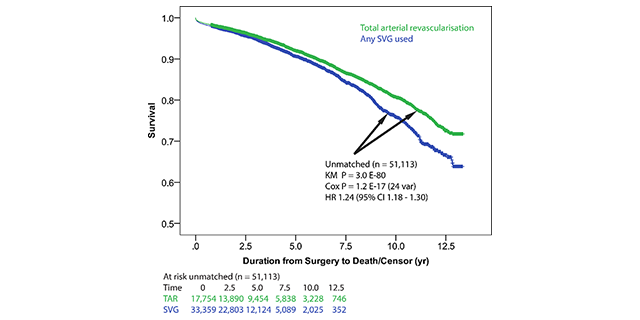 Survival plot for total arterial revascularisation vs. any use of saphenous vein graft (n = 51,113). SVG, saphenous vein graft; KM, Kaplan-Meier; Cox, Cox proportional hazards analysis; var, number of variables included in the analysis; HR, hazard ratio; 95% CI, 95% confidence interval. Figure 2. Survival according to number of saphenous vein grafts used. 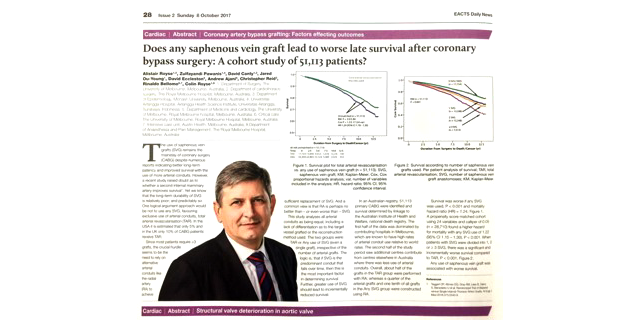 Per patient analysis of survival; TAR, total arterial revascularisation; SVG, number of saphenous vein graft anastomoses; KM, Kaplan-Meier. Is a wire or a plate better? 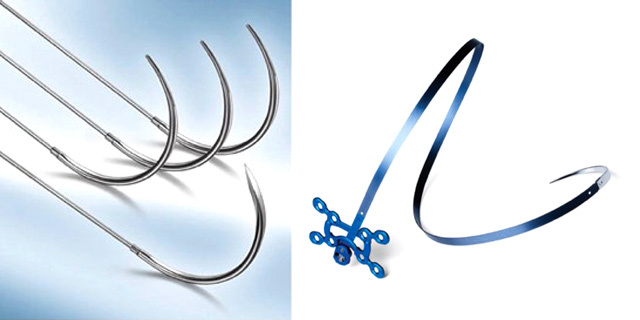 Cardiac surgery has always used stainless steel wire to close the sternum - so a prospective randomised study using orthopaedic plates is long overdue. Cardiac surgery needs the sternum to be divided to allow for good access to the heart, the problem is that bones heal slowly. A divided sternal bone takes just as long as a fractured arm or leg to heal (around 2-3 months), but unlike an arm or a leg, it is very difficult to immobilize the sternal bone when someone needs to keep breathing, coughing and moving about. In fact, the sternum would be one of the most difficult bones to keep immobilized and keeping a bone from moving, is one of the key factors that is necessary for good bone-to-bone healing. Otherwise, a fibrous union (scar tissue) forms between the bone edges and tends to lead to chronic pain (usually) and instability (less commonly). What is not often appreciated by surgeons, is that even though there may be good apposition of the bone during the surgery (when the patient is under anaesthetic), as soon as they are awake and moving, these bones will often move. If the cortex of one side overrides the other, then the tension in the wires that keeps the bones together is lost and the bones are no longer kept immobilized, leading to poor healing. We have a prospective randomized trial of a new sternal plate and banding system being compared to the conventional wire closure in 50 patients. The study is being conducted at Royal Melbourne and Melbourne Private hospitals. The novel assessment is the use of high frequency ultrasound, which can dynamically measure motion at the cut edges during activities such as coughing. This will be performed several times during their hospital stay and after discharge. Additionally, a CT scan of the sternum will be performed at three months. This study, involving the use of ultrasound as the imaging modality, is the first of its kind in the world. Motion of the bone edges is very easily and reliably detected using ultrasound and will most likely pave the way for routine assessment of sternal bone healing. It could also be used to assist with other bone fractures or plate fixations. The investigators are Prof Alistair and Colin Royse and Assoc Prof Doa El-Ansary.